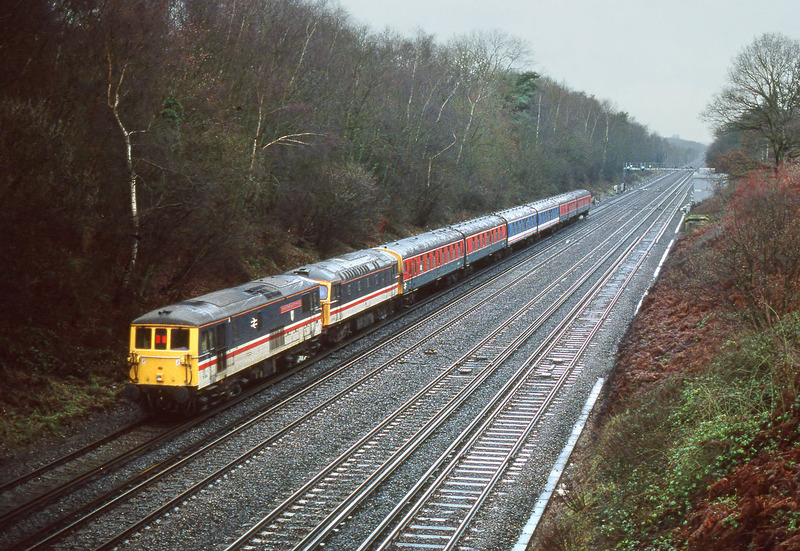 73205 London Chamber of Commerce pushes the Eurostar bogie high speed test train past Newnham in the rain on 17 December 1991. Class 33 33115 (83301), heavily modified and fitted with Eurostar bogies and current collection equipment is coupled between the 73 and the train, which is Derby research liveried Class 438 4-TC 8007, with two additional coaches inserted in the centre. The 73 has had its pick up shoes removed, and is receiving power from the 33 via a heavy duty cable. Apologies for the poor quality, but to say the weather was grim is an understatement!